ATV’s and off highway recreational vehicles are a world of excitement and fun for kids, as well as a rare bonding opportunity for families to get away from the TV and do something together. However, the harsh reality is that each year over 100 children in the United States are killed in ATV-related accidents. Let’s face it: putting a kid on a machine that weighs a couple hundred pounds and can exceed speeds of 40 miles per hour has its dangers. So how do we, as responsible off-road fun-loving families, safely allow our children to join us in ATV riding as a hobby? Children’s ATV safety begins with the machine. Hundreds of different ATV configurations are available for purchase and it’s imperative that parent’s consider the size and ability of their child when making a purchase. Although it may not seem appealing to have to replace a child’s ATV after a couple of years to continually accommodate their size, riding the proper size ATV may mean the difference between life and death. 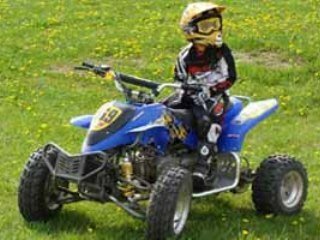 The Consumer Products Safety Commission is quick to point out that many ATV incidents involving children are attributed to a child riding a machine too large for them to properly control. When it’s time to buy your child an ATV, take them to the dealer with you and make sure that they are able to easily reach the foot rests, handlebars and comfortably control the vehicle. Many local groups including ATV enthusiasts, 4-H and ATV dealers offer safety courses at little or no cost. Courses like these are designed to help new, and experienced, riders refresh their recollection of key riding elements and how to have a good time without breaking a rib or three. Even if you’ve been riding for years, let’s face the fact that sometimes kids just need to hear it from a different source. Try attending one of these classes as a family and enjoy a Saturday of education and riding. Some safety advocate groups go so far as to recommend that laws be adopted prohibiting children under 16 to operate an ATV at all. In the long run, people could come up with reasons to de-legalize just about anything for children. Riding a bike, skiing, skateboarding, hunting and just about anything else a 9-year-old thinks up can be dangerous. Then again, so can walking down the street. I’m a firm believer that children should be exposed to a variety of activities in the great outdoors and that we, as parents, should have the right to decide what is and isn’t safe for our children. When push comes to shove, the biggest factor to making ATV riding safe for our children in common sense. Talk to your kids openly about the dangers of riding and weigh the risk against the reward. In the end, it’s all about having respect for the power of your machine and knowing the limits of your ability. And heck, if you think it’s a little scary to let your kids behind the controls of an ATV, wait ‘til they want to borrow the car!